A chair is an essential addition to any room though creative and talented designers can offer an exciting aesthetic dimension to this most rudimentary piece of furniture. Russkell Furniture are experts at designing and creating chairs that make a statement, offering a vast array of fabric types, styles and colours to allow infinite scope for design. Incredibly popular amongst both our staff and customers, the Kirby Tub Chair is one of our best-selling designs thanks to its superior levels of comfort and style. With a timelessly elegant shape, the chair complements any room and even works well as a bathroom seat. A compact, neat appearance utterly belies the supreme comfort offered by the Kirby Tub Chair, which has a generous 790mm width and 720mm depth. Curving arms rise in an elegant and dramatic curl to form the high back of this sophisticated chair, which rests on four strong legs tucked under its base. With over 26 fabric and more than 40 leather choices available, the Kirby Tub Chair is infinitely customisable, allowing customers to match any aesthetic or create a new one from scratch. Within the leather choices is the beautiful and exclusive Tribe collection, featuring leathers in stunning tones of Damson, Ecru, Barley and Sequoia. Opulence Velvet, part of the fabrics collection, is equally breathtaking, offering luxuriously soft fabric of Silver, Chocolate and Ivory hues. 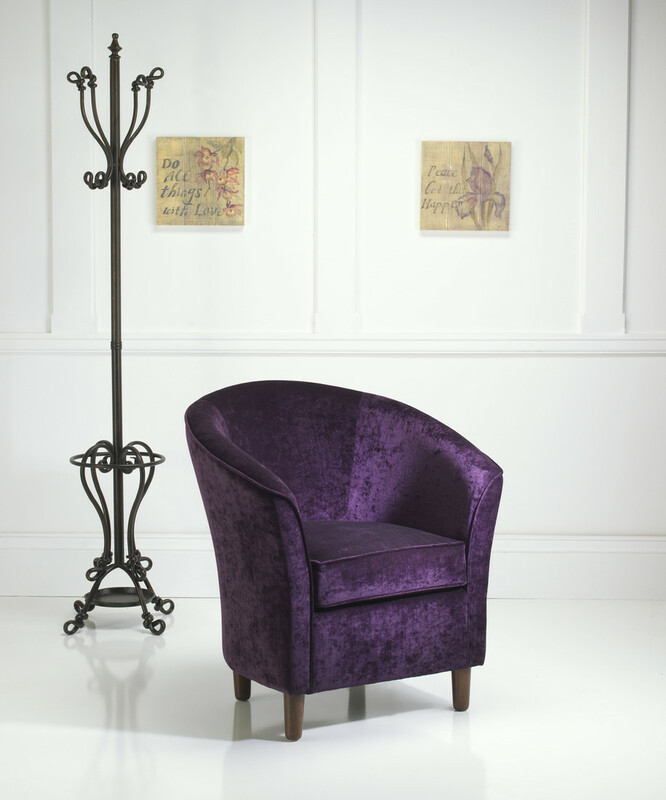 As well as this made-to-order chair, we also offer a range of occasional chairs from stock; this range includes the magnificent, wild and wonderful Alice Chair. Bold and bright, the chair is covered with a patchwork of vibrant and dramatic fabrics clearly inspired by the famous Wonderland visited by Alice in Lewis Carroll’s books, making this chair a real statement piece. Please browse our fantastic and extensive selection of quality seating options and do not hesitate to contact our team for further information and advice about any of our products. Call Russkell Furniture today on 01254 773232 or send email to sales@russkell.co.uk.